Litter in front of an abandoned house in Liberty City. The neighborhood where kids grow up often impacts the people they become. That's part of the reason Samuel Latimore, president of the Hadley Park Neighborhood Association in Miami, is worried about the look of some of South Florida's lower-income neighborhoods. He says litter in yards, broken fences, abandoned homes and dead animals can leave a lasting impression. "I'm passionate about how children develop, passionate about these -- I call them my 'shorties," he said. "All shorties, not just one group of people. Not African-Americans or Hispanic Americans or white Americans, but all of the kids are my shorties." Latimore is a retired criminal justice professor and former juvenile detention superintendent. He grew up in Liberty City. He talked with WLRN's Kate Stein, showing photos of "environmental injustice" he's seen in some of Miami's neighborhoods in recent years. Latimore started with a photo of an abandoned house on Northwest 67th Street in Liberty City. Latimore: The house was on a corner directly in front of an elementary school. Right across the street. There's 12th Avenue; there's Holmes Elementary. And it got so bad that they (the children) would have to walk out in the streets in order to avoid walking on the stuff. WLRN: There's a car seat. There are all these discarded newspapers. Basically the whole ground is kind of littered with just -- stuff. 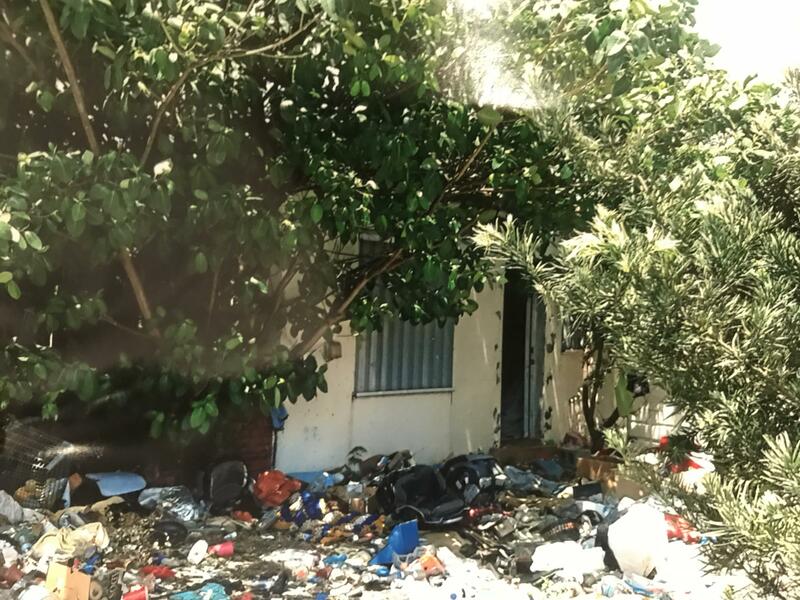 For five years, litter piled up in the front yard of an abandoned house across from Holmes Elementary School on Northwest 12th Avenue and Northwest 67th Street in Miami. No one seemed to think that this would have an impact on these children walking by this every day -- coming to school, sitting in school, looking across the street from their school for five years. Five years. So that's an example. This is another example of the environmental injustice. This dead dog that was laying there in the street. I was going to some event next to Liberty Square and I saw the dog at 9:45 in the morning. So I called and I think some other people call to have the dog picked up. I came back by to see if the dog had been picked up at about 4:45. The dog had not been picked up. So the dog was there from about 9:00 in the morning to about 4:45. I took pictures of a family walking by the dog and you can see what they had to do. The child was traumatized because that's what they had to see as they walk down 62nd Street. Now there is no reason why police passing, buses passing, and other governmental folk passing -- that dog should remain there. 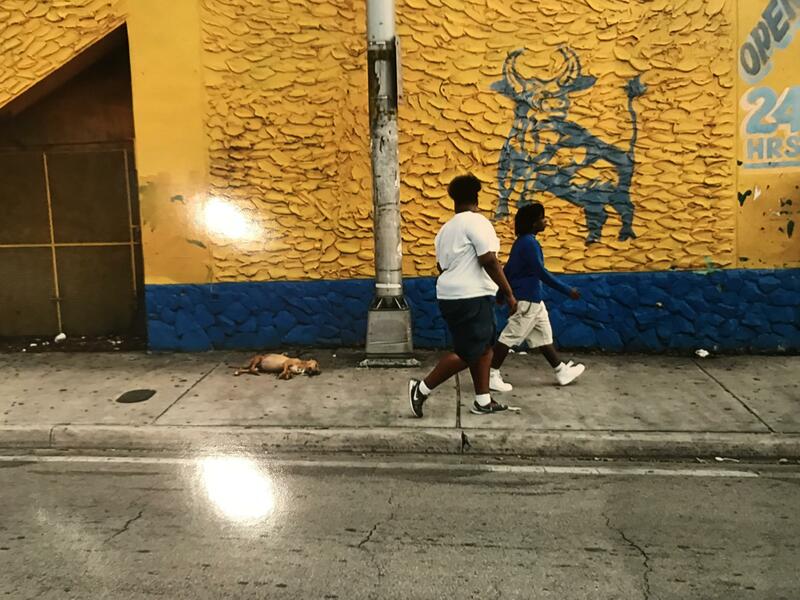 A dead dog on Northwest 67th Street in Miami was left lying on the sidewalk for an entire day. Latimore says a store owner eventually put the dog in a dumpster. What sort of impact do you think this has on children -- when there's a dead dog in the street or a house abandoned with litter piling up for five years? I would call these children prisoners of war. To see all that negative stuff over a period of time -- it makes them emotionally numb. It's called "emotionally blunting." After a while, even the police don't see that (the dog), after a while the bus drivers don't see that. The children are much more susceptible than anybody else. What environments you grow up in, what experiences you have dictate how you perceive your world. And we talk about the pipeline from school to prison. Maybe we can disrupt that by ensuring that our communities are perceived to be safe and healthy. What does a child think when a helicopter is constantly buzzing over your head and standing there with the lights going down because they're looking for some bad guys? Or when you hear shots? When you hear shots in some communities they think it's a backfire. When you hear shots in our community we hit the floor. How do we rationalize the psychological effect of that on a child? So in communities that are dealing with violence, where on a random day, someone could be shot, how do you bring attention to environmental issues? This is a piece of it. Let us give the environment that these children walk through -- make it look safe as they leave school, when they arrive home. Take that piece of the stressor out of their lives. Start holding people accountable for not passing a dead dog on the street that children have to walk over for hours. That's how long officials expect residents to be able to survive on their own after a hurricane strikes, which includes having on hand three days' worth of food, medicines and other necessities, according to Mark Moore, deputy emergency manager for the City of Miami.